Way back in the 1960’s Ships carried Radio Officers who worked two hour shifts from 0800 until 2200 hrs each day. This was to spread a manual listening watch for distress, safety and communications. Some maintenance was done when possible to radio and navigational equipment. This was mainly radio transmitters, radio receivers, auto alarms, public address systems, radar, vhf (if fitted) communications to/from the UK via Portisheadradio using an Area System. Between 1965 and 1999 various schemes were tried – radio watches were reduced from 8 hours per day to 4 hours watchkeeping and 4 hours maintenance. Morse code gave way to telex, DSC and finally GMDSS and satellite communications. The Radio Officer became the Electronics Officer, sometimes the ships secretary preparing port papers as well as communications duties. Gradually the Radio Officer became history. The Electronics Officer was born with Marine Electronics Certificates, Radar Maintenance Certificates and instrumentation, data logging etc added to the Electronics Officers armoury. 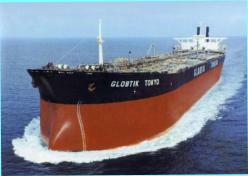 Several shipping companies tried various job descriptions for the ETO. Basically a shipboard technician who could maintain radio, radar, nav equipment, electrical equipment in the engineroom and around the ship. In a drive to get more out of the ETO – it was a requirement that the ETO also take a 4th engineers ticket. So he could go “on the Box “ as a duty engineer and carryout electrical/electronic maintenance around the ship. This was counter productive as it was effectively 2 jobs in one. 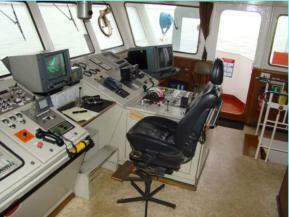 There is enough electrical/ electronic work onboard ship without having to carry out a 4th Engineers Duties. The job is evolving year on year. From fault location down to component level (1970-1980) to fault location to Printed Board level ((PCB 1980 – 2000). From a period of excellent industry in inhouse training courses, to a period of no or little training given to newly qualified ETO's From Carrying a good selection of spares to carrying virtually no spares at all except fuses and lamps. From Having excellent Operator and Service Manuals to carrying just Operator manuals. Lack of Training and Loss of expertise has been sadly endemic throughout recent years. The shipowners answer to lack of onboard expertise was to use shore side maintenance contracts particularly with regard to GMDSS equipment. This may now come full circle. It may now be more economical to employ better trained ETO's onboard vessel, with better manuals, better spares and better technical backup. There is a shortage of Shoreside Technicians so it is becoming important to recruit, train and retain ETO’s Technology Which was experimented with in the late 1960/1970's is now a reality on new ships so it has taken approx 30 years to be incorporated in newly built ships. The maritime version of <the black box, used by aircraft> the VDR is now becoming compulsory on new ships and a retro fit item on older ships. More satellite technology, Satcom A being phased out, Satcom B being replaced by F77. GMDSS telex phased out and replaced by a second Satcom C unit. Bridge Control: All of the controls are within arms length from our seat! Updated Integrated Bridge Control Systems. New Generation DGPS units. The internet on cargo ships, satellite televison, not just for passenger ships. 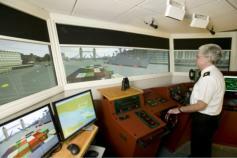 AIS (automatic identification systems), CCTV systems for security and anti piracy precautions. Better gas detection, tank gauging, custody transfer systems. Distributed Control Systems (DCS). The introduction of computer control (PLC units) on engineroom systems.The need for laptop units to program newer technology units. The author anticipates with the new generation of ships now being built which are now bristling with new and upto date technology – there may be a new generation of ETO required. There may be a need for an updated version of the MARINE ELECTRONICS TICKET which the MNTB introduced in the 1970’s. 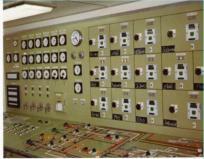 many ships cannot run without electrical power systems, ups and backup systems. It is possible to run newer build ships In Manual mode. A lot of new thinking is required and ships of the future may need more than one ETO. In the next generation of ships complements. Passenger ships and RFA vessels already recognise this – other vessels such as reefers, cargo vessels, tankers, gas carriers etc may need to learn this the hard way! In a few years time I can see an "ETO department”, just like the navigational and engineering department, due to the complexities of electronic control of navigation communication - electrical and automated control at sea requiring a far larger department.